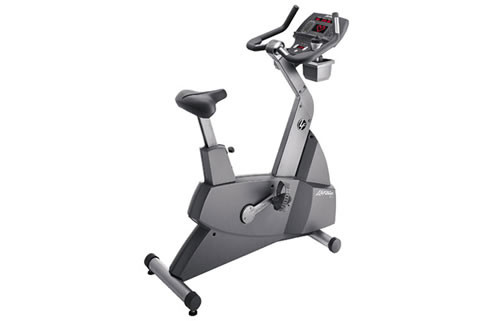 You'll find every up-to-the minute cycling convenience on the Life Fitness LifeCycle 95Ci Upright Bike. With multiple workout programs available to keep your heart rate in its correct training zone, you'll stay engaged with the pedals as you burn fat and strengthen your quads. The Life Fitness 95Ci was built for rideability, too, offering you a slotted, "Comfort Curve" seat that takes the heat off your backside and puts it on the muscles you want to target. Further enhancing your riding experience, the 95Ci comes with a selection of 26 seat heights and pedals which adjust to 11 positions so you'll sweat with maximum efficiency. To gauge your progress, there are several FitTest protocols and even a United States Air Force Certified riding test. As this machine has been designed with ergonomics in mind, the 95Ci provides precisely placed handlebars that you can grab on top for a more aero-position or on the sides for stability. Heart rate sensors located on these handlebars provide instant intensity feedback, and if you like to distract yourself from the task at hand, you can equip the 95Ci with an attachable LCD Entertainment System, or E-Z TV Console. All in all, since it's cordless, can go anywhere in your home or gym, and displays workout data in 9 languages, the Life Fitness 95Ci offers a state-of-the-art stationary cycling experience for users of all abilities.